‘Black-birding’ is a British term which was used to speak of the 19th century Pacific labor/slave trade for the colonialists. Australia, France, Britain, Germany and the United States were the main traders. Blackbirding mostly involved kidnapping and trickery (to sign contracts) for laboring in mines and plantations in South America, the U.S., Canadian West Coast, and Australia and their colonies. In addition, many of the Pacific islands themselves had small plantations for workers to be transported to work from other islands. They often worked alongside Japanese, Chinese, and others in later years, tricked or stolen to do labor in farming. As you can surmise, there were many relationships and marriages between different groups as time went on. During this period, similar to the most brutal of African slave-trade stories you have heard, the conditions and behaviors meted out to the islanders during capture, transport, and/or working life, were horrendous. Many scholars and artists today, speak of the African slaves brought to work in places such as Peru, Brazil, Australia, and elsewhere. Many of their research, I’m afraid, is influenced by the ‘Atlantic slave-trade’ consciousness, as far as the identity of darker-skinned people. In addition, many scholars including archeologists, are determined to collapse Asian dark-skinned people as original Africans. I do not believe that this is so in every case. I prefer to think of dark-skinned people as having been in many places. These people have been on earth for tens of thousands of years. Many scholars also ‘white-wash’ and dilute, in order to refuse, deny, hide, and distort the histories of the Pacific slave trade, making it more of a ‘migration’ or ‘recruitment’ imagination, twisting history away from what was going on. It is true that many were forcibly taken or deceptively recruited and then thrown into manual labor and displacements to far away places in a way differing from the Atlantic African slave trade. However, the effects and violence were similar in many ways. This cannot be refuted, as more research is done and we actually ‘Listen” to the stories of the indigenous and black-Asians that are alive today. They know their heritages. From colonizing Hawaii to slave practices that stole bodies and decimating communities in Fiji, Samoa, Guam, Tahiti, Micronesia, the Solomons, the Hebrides, and almost all islands in the middle to southern Pacific, massacres, using kidnapping and false promises for ‘peaceful and willing’ recruitment. Of course, many died from contact with diseases from Europeans and Euro-Americans, as well. Families were torn apart and the vulnerable–mostly women and children, were stolen to also toil in mines and fields, and then to survive. We should note that the Pacific slave trade intensified *AFTER* the laws freeing the slaves in the United States was passed. These tribal people have not disappeared. Although decimated, they have been thriving and growing in numbers in recent years, as the world’s powerful nations have concentrated on other wars and colonial projects. 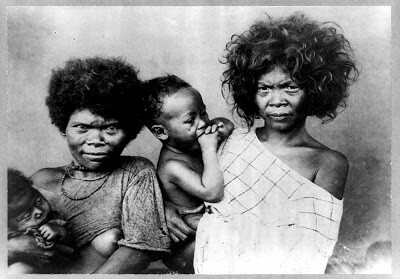 There is a growing reality of linking various dark-skinned Pacific peoples with the other indigenous and native groups in Asia and the Americas and Europe (such as the Sami people of Finland) to form fourth and fifth world solidarities and fight for their rights in the present age, which they continue to have to do. The world structure continues to purposefully or unintentionally through ignorance, be invested in making them a ‘people of the past’ and cannot see the Black-Asian peoples and other indigenous people as present now, here. My thinking is that this is due to the fact that most people do not know anything about this history. Because of this, as mentioned before, there is an ‘African’ and ‘African-American-izing’ of Black peoples. This is also a problem. Blackbirding is also still present. Many more Africans, Asian, and Latin peoples are being forcibly, in many ways and techniques, displaced. In the present world system, more than any other, bodies are used for the labor-duties of the dominant. Even pleasure, is made into this. Making it worse, as is the case everywhere, this form of power and degradation is seen as something to access for gaining wealth and power and/or just to survive, as many non-Europeans mimic this and begin their own blackbirding for various reasons. The controversies surrounding ‘Human Trafficking’ are linked with this intensely. History is not past. It is now. Thank you for your hard work, time, and effort for this valuable information.